Retail is a tough business and many analysts question how traditional retailers can survive in the new environment. These concerns are in the headlines now but they are nothing new. Retail has been a difficult environment for decades. Sears changed the retail world in the late 1800s. Prior to their mail order catalog, retail purchases were made at the country store. Customers would negotiate prices for reach purchase and shopping was an arduous process. The Sears catalog changed all that, but it was not without controversy. Sears won that battle and retail was changed for good. But, now retail is facing more changes and Sears may not survive much longer. In fact, department stores may not survive as we know them. But, this is not a surprise to smart investors. As Munger tells us, tomorrow’s retail winners are likely to look different than today’s. Tomorrow’s winners might be startups, online merchants or existing companies with innovative business strategies. 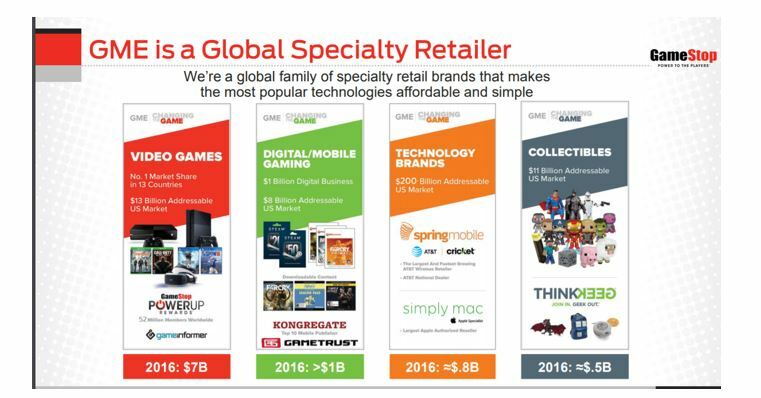 Among the latter group is GameStop Corp. (NYSE: GME). GameStop is best known as video game retailer. But, the company is also a mobile phone provider, an authorized Apple service provider and a relatively large player in the collectibles market. The chart below was presented by management at the most recent share holder meeting. The diversity of the business explains why GameStop calls itself “an omnichannel video game retailer.” The company sells video game hardware, physical and digital video game software and video game accessories at stores and online or as downloadable products in its stores. According to the company, GameStop is the number one video game retailer in 13 countries. As the chart above shows, video games account for more than 93% of the company’s business. GameStop already controls 38% of the market for video game sales and digital and mobile gamins. Other divisions are small, but growing rapidly. SpringMobile resells AT&T’s wireless subscription services and Cricket’s prepaid cellular services. These brands are natural fits for the company’s video gamer demographic since the digital gamers will most likely need affordable data plans. SimplyMac is the largest authorized reseller of Apple products. The store fronts sell Apple computers, iPhones and watches. SimplyMac also accepts trade ins of used devices and sells used products. This is appealing to the video gamer demographic who may be budget conscious. Operating earnings for this division are expected to grow at more than 20% a year according to management estimates. GameStop also seeks to provides collectibles to that demographic through its ThinkGeek brand. Collectibles is a highly fragmented, $11 billion a year market. ThinkGeek already has a significant market share of 4.5%. Management estimates operating earnings for this division will increase at an average rate of 10% a year. Overall, earnings per share (EPS) growth is expected to average about 7.5% a year for GameStop over the next five years. Analysts tend to be optimistic and while this growth is realistic it is lower than average. In fact, 72% of published estimates for EPS growth are higher than GameStop’s. GameStop has been a market laggard since the end of 2015. The stock has also been among the deepest bargains in a largely overvalued stock market. The chart below shows the price to earnings (P/E) ratio has consistently been below 8, less than half the market average, for the past two years. GameStop presents a short term trading opportunity since the company is scheduled to announce earnings after the close on August 24 (Thursday). If history is a guide, we can expect Friday to be a volatile day for the stock. On average, GameStop sells off by more than 5% in the week after announcing earnings. It seems as if a steep sell off in the stock is unlikely for now given the stock’s valuation. Based on this year’s expected earnings, the stock is trading with a P/E ratio of just 6.3. Next years’ EPS estimates are for about the same as this year’s. The stock appears to be a bargain at just 6 times earnings. However, the expectation of a sell off has increased options premiums in the stock. Premiums show the stock is expected to be more than six times as volatile as the overall stock market. That sets up a potential trading opportunity in GameStop. To benefit from increased levels of volatility, traders can sell options. Selling options, however, is a strategy with a high degree of risk. 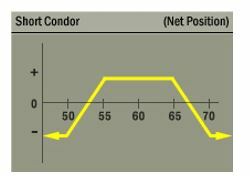 To minimize the risks, a variety of strategies can be used including a short iron condor strategy. To open a short iron condor position, the investor sells one call while buying another call with a higher exercise price and sells one put while buying another put with a lower exercise price. Typically, the call strikes are above and the put strikes below the current level of underlying stock. The distance between the exercise prices of the calls will need to equal the distance between the exercise prices of the put options used in the trade. All the options must expire at the same time. This is a strategy that benefits from an underlying stock that trades within a relatively narrow range during the life of the options. For GameStop, we can use options that expire on August 25, the day after the earnings report. While the stock will have some volatility that day, this trade benefits if the volatility than the expected level of volatility. The potential risks and rewards of this strategy are shown in the diagram below. This trade will result in a net credit of about $0.60, or $60 per contract since each contract represents 100 shares. That is also the maximum gain of the trade. The maximum potential loss is equal to $90, the difference between the exercise prices ($150) and the premium received. This trade offers a potential return of 67% on the amount of capital risked. The maximum gain is achieved if GameStop closed between $20 and $22.50 on Friday. Moving outside of this range would require a move of more than 5%. That is a price move larger than the average one week move in the stock following an earnings announcement. Outside of that range, the potential gain diminishes. If GME closes above $24 or below $18.50, the trade will realize its maximum loss. This strategy provides exposure to the expected decline in volatility after the earnings announcement with limited risk and last just one week. It could be appealing to small investors since it allows for rapidly compounding gains, assuming the trade delivers the expected gain.